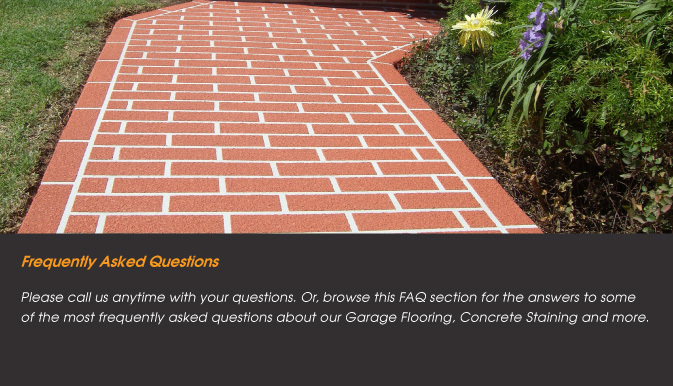 How long does the garage flooring installation process take? For most Scottsdale and Phoenix garage flooring jobs, the installation process takes 2-4 days. 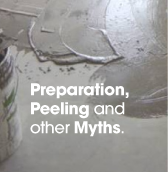 Concrete stain (including concrete acid stain) and polyaspartic coatings have a faster turnaround than epoxy concrete floor coatings and concrete overlays. We offer garage floor coverings, concrete sealing, concrete stamping, driveway coatings and more for residents of Mesa, Glendale, Chandler, Ahwatukee, and beyond. How durable are your garage flooring products? 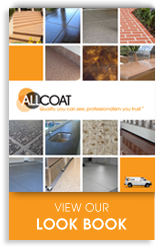 All of AllCoat's Phoenix garage flooring projects include garage floor covering, garage floor epoxy coatings, driveway coatings, and walkway coatings which offer superior stain resistance and durability. Our garage floor coverings, polyaspartic coatings, and epoxy garage floor coatings are resistant to sodas, gasoline, alcohol, and even xylene. Join the Peoria, Sun City, Rio Verde, and Cave Creek clients who count on our top of the line garage flooring epoxy resin applications. Is your concrete staining affordable? Our Scottsdale concrete stains and concrete flooring products are very affordable. We have garage floor coatings starting at just over $1.50 per square foot, with pricing for concrete overlays for patios, pool decks, and driveways depending on the design chosen by our clients in Carefree, Phoenix, Paradise Valley and beyond. Choose from acid stained concrete, concrete floor epoxy resin, stamped concrete, garage floor covering and more. 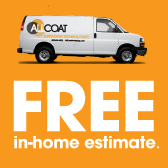 Let AllCoat be your Phoenix concrete stain and garage coating company of choice. How many colors and patterns of your polyurethane coating and garage epoxy are available? Epoxy resin colors for our garage epoxy flooring and other concrete coatings are limitless. We offer 16 standard colors for polyurethane and epoxy floor covering and custom color matching upon request. You'll find the finest in concrete acid stain, concrete refinishing, patio coatings, driveway coatings, concrete restoration, and more. We'll work with you to find the garage floor epoxy color you desire. 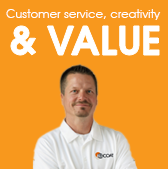 Does your concrete stain and other floor coatings come with a warranty? Our concrete stain and other concrete resurfacing and repair come with a warranty against workmanship, yellowing, chalking or delaminating. Ahwatukee, Peoria, Sun City, and Rio Verde residents have long looked to AllCoat Surfacing for concrete overlays including concrete acid staining, concrete sealing, stamped concrete, stenciling, concrete patio covering and more. Stain concrete warranties vary with the type of system installed.